If you have a full-suspension mountain bike or a bike with a unique frame, then you'll want to use a platform style rack that has no frame contact. 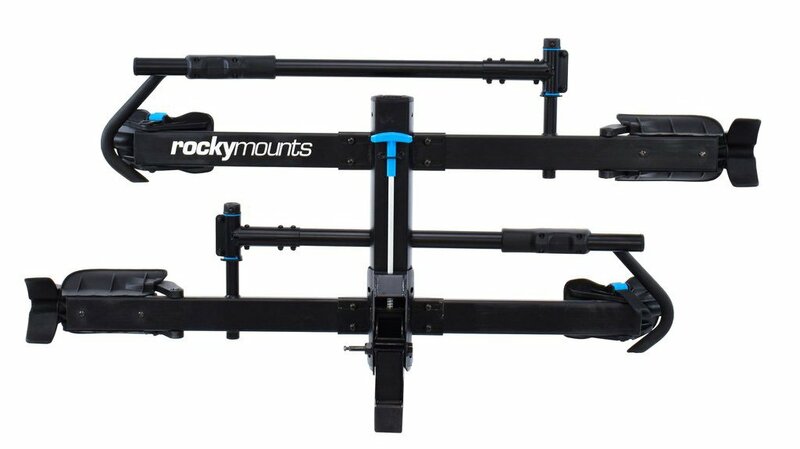 The RockyMounts MonoRail Hitch Rack is a platform rack that holds kids bikes, road, mountain, and fat bikes with ease. It has an easy-release handle that folds the rack into three different positions: stow, in use, and tilt away. It will fit up to 5.0" wide tires, bikes with up to a 48" wheelbase, and tire diameters from 20" to 29". It has 3" of side-to-side tray adjustment to avoid seat and handlebar interference and has 13" spacing between the bikes that accommodate clearance for fat bikes. The MonoRail includes an anti-wobble locking hitch pin and cable lock. The rack can be expanded to three bikes from two with the MonoRail Add-on. Fits tires up to 5.0" wide and wheelbases up to 48"
Super sold build. I like that it is a full 2” post to the receiver hitch. Easy load and unload of bikes. Two full suspension bikes are solid as a rock on this rack. . Locking cable is okay but could be beefed up in my opinion. Rack does not tilt down which might be a problem for some people, but I prefer less complexity and think this rack is more robust compared to similar racks with the tilt down feature. All and all I would highly recommend this rack. Is this available for a 1.25 hitch?